I was very pleased when I received my coat. The sizing is pretty accurate and the coat is good quality. I would recommend this getting this coat. Ever stylish, this double breasted polyester pea coat pairs perfectly with everything from skinny jeans to dress slacks to pencil skirts. When fully buttoned, the wide notched collar provides a flattering V-neck look and the double row of buttons elongates and slims the torso. 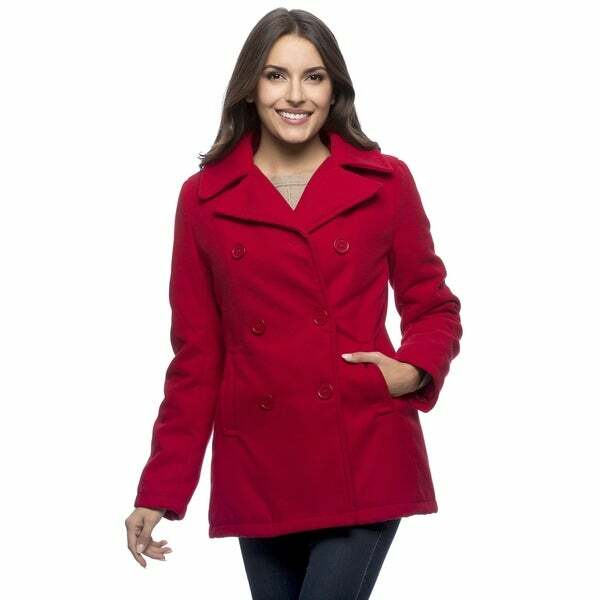 Crafted with a 100-percent polyester lining and shell, this women's pea coat is fully machine washable. The approximate length from the top center back to the hem is 29 inches. The measurement was taken from a size medium. I was pleasantly surprised at the quality of this item, however it was much too big and I have to return for a smaller size. I normally wear a size 10/12 and mistakenly ordered an XL as I'm accustomed to a Large being a bit snug. Could probably get away with a Medium in this coat. I would definitely recommend this coat. Great price for a quality item. If you are looking for a soft flimsy feel, this is the coat for you. Being retired from the Navy, I was expecting a heavy pea coat similar to my uniform pea coat I wore when serving. This coat is more like fleece than like the wool. I returned the coat and was very satisfied with the no hassle return procedure setup by Overstock. I called their toll free number, and their associate sent me an email with a return label attached for no charge. Although I didn't care for the product, I remain a loyal customer of Overstock.com. They go out of their way to provide excellent service. Thanks O! Purchased women’s double breasted pea coat. Coat is very warm and comfy. I’m very happy with purchase and would definitely recommend to anyone looking for a warm coat. This pea coat was alright but I wish it had been a little more fuller in size. I purchased this coat in Ivory, Size 16. Usually it seems double-breasted garments make people look heavier than they are, but I took a chance on this one. It is actually slimming! Great quality, nice warmth level for DC-area winters. Fabric feels good, and I’ve gotten lots of compliments. Great purchase for me. This was an excellent purchase for me. I like how this fit me and the buttons were placed. This wasn't bulky like the previous Pea Coat I purchased. I needed a new coat to wear to work or casual... with jeans, slacks and long skirts. This coat is perfect! I'm 5'8" and 170 lbs, curvy. This coat has a nice shape ...not boxy... is made of very high quality material and just fits like a glove. I absolutely love it and highly recommend this! Very warm, styled nicely. Arms slightly too long, although rolled once is fine. Buttons secure, stitching accurate. Fits nicely, attractive double breasted coat. To late to return so stuck with the item Never again will purchase Clothes from Site. Versatile coat for everyday use. Run's a bit large. Fits nicely . Comfortable to wear. Love it. I was surprised and delighted when I received this coat. It has a great look, and is well made. It is also heavier than I thought is would be, which is actually a good thing. I'm sure it will serve me well in the winter. This coat was very cute but the sleeves were very tight. So back it went. It was also a little heavier than I wanted for spring. The purple was a very nice shade! Color is great and super warm. Not itchy at all. The coat fits perfectly, and is very soft, and super warm. I’m so excited about this gift. I got it in and was impressed with the quality. It’s heavy and should keep my Mother super warm and snuggling with looking stylish. Item too large, didn't realize that there are no free exchanges. "What material is this made of?" "Do they come in petit?" My Mother always wanted one..it's her birthday! "Hello, What is the measurement from shoulder to hem in a size L? What is the length of the sleeves in size L? What is the measurement across the back shoulders in size L? Please send the same measurements in a size M. The measurements in size guides are notoriously inaccurate. I very much appreciate your kind assistance. Thank you." Thank you for contacting us, elaineabooth. Measurements for size Large are approximately; Shoulder to hem- 29 ½ in. Length of sleeves- 34 in. Across the back shoulders- 17 ¾ in. Measurements for size Medium are approximately; Shoulder to hem- 29 in. Length of sleeves- 33 ½ in. Across the back shoulders- 17 in. Please let us know if you have any further questions. "Will a Womens XL in this Coat equal a 18 regular ?" Thank you for contacting us, jwill58. No, an XL would fit a 16 comfortably. A size 2 X would fit 18. Please let us know if you have any further questions.